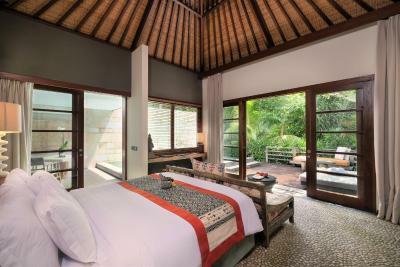 Lock in a great price for The Purist Villas & Spa Ubud – rated 9.4 by recent guests! Love everything about this place! Great place and friendly staff! The decor of the entire place, its just hands down amazing. We love our garden suite. We immediately fell in love with it. Plus, the scent of jasmine is amazing, and its everywhere. It immediately makes you feel relaxed and comfortable. Also, shout out to the most attentive and friendliest staff! 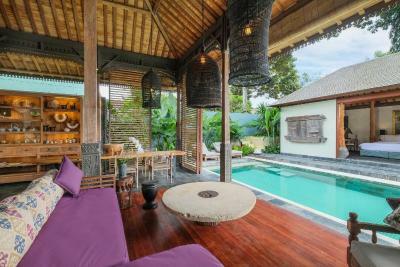 The Villa was beautiful, the huge bathtub was amazing and we loved the pool! The staff were wonderful, sweet and friendly and took care of all our needs. From the turndown service to organising drivers we didn’t have to think of a single thing which was just what we needed. The kitchen staff even made us up a vegan dessert when dining in on our last night which we really appreciated and delicious. 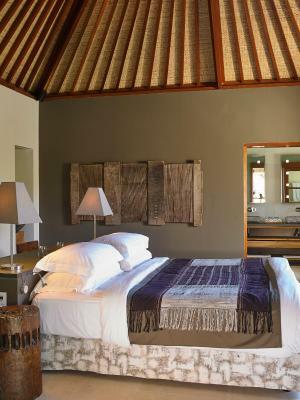 Lovely place to stay when visiting Ubud. There is a taxi service into town and back at designated times and available for a small charge at other times. Very peaceful. 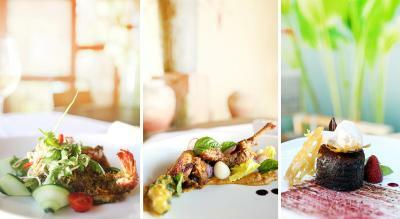 The food in the restaurant is delicious but it's probably more interesting to go into Ubud to eat. Staff are very accommodating. Fantastic place to relax and enjoy the views and sounds of nature. The staff was great, they took care of everything without being "in your face" or making you feel awkward. Villa we stayed in was gorgeous. We loved out stay at Purist! First and foremost, the staff is incredibly accommodating and friendly. 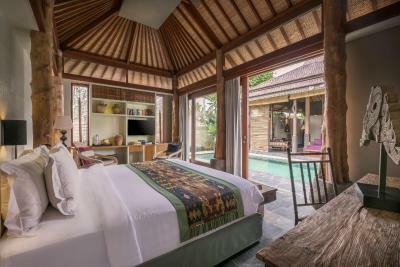 The Jungle Pool Villa was outstanding, great space, loved the bed and our own private pool! Eco friendly designed and feels like a spa and a resort. The bed was very comfortable. The breakfast was lovely except for the stale bread and cinnamon bun. Staff was very attentive and friendly. 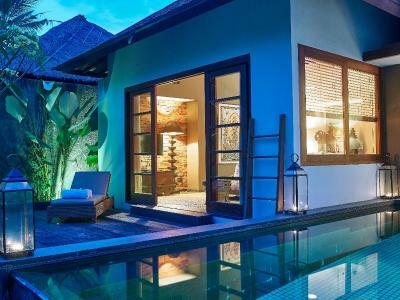 The Purist Villas & Spa Ubud This rating is a reflection of how the property compares to the industry standard when it comes to price, facilities and services available. It's based on a self-evaluation by the property. Use this rating to help choose your stay! 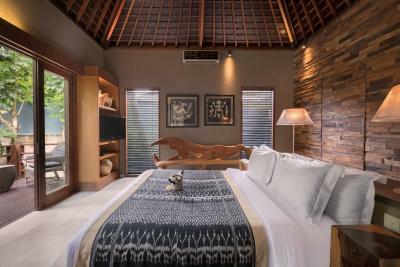 Nestled amidst tropical greenery, relaxing stays await guests in these luxurious modern Balinese-style villas. 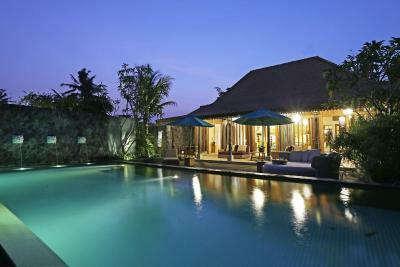 Featuring a landscaped pool with a deck, The Purist Villas and Spa features a restaurant and free internet. 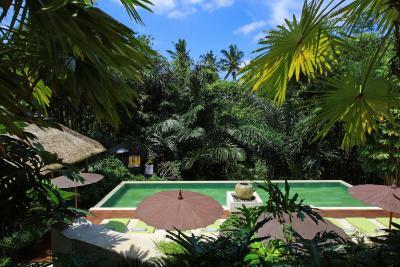 Situated behind a Balinese village, The Purist Villas and Spa is a 25-minute walk from central Ubud. It is a one-hour drive from Ngurah Rai International Airport and offers free parking. 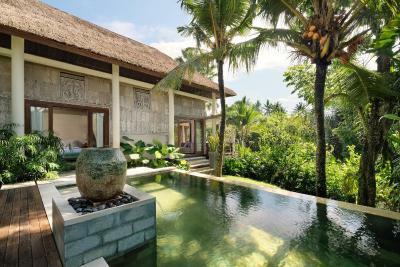 The tastefully designed villas feature a rich blend of the traditional and the modern, showcasing Balinese craftwork and fine wood furnishings. They all include comfortable sofas, flat-screen TVs and DVD players. 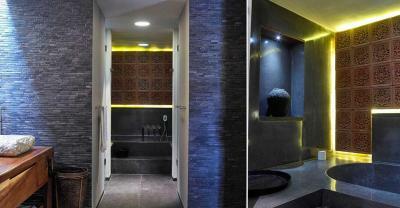 Guests can enjoy massages and body treatments at the Purist spa or take a cooking lesson. 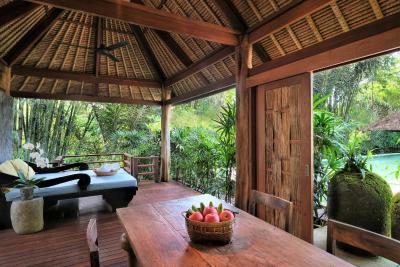 In addition, the staff can provide yoga lessons or organize day trips. Lunch and dinner are served at The Living Room Restaurant, which features lounge sofas. 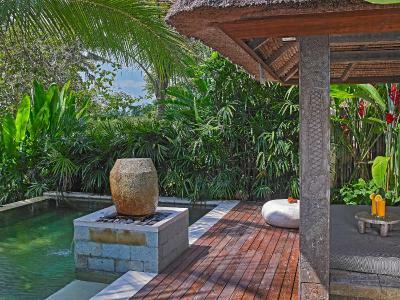 The Pool Cafe serves Balinese snacks and freshly squeezed fruit juices and cocktails. 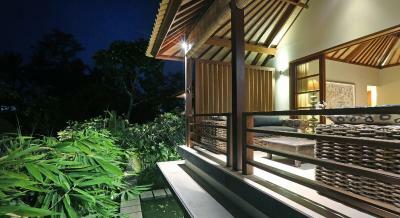 When would you like to stay at The Purist Villas & Spa Ubud? 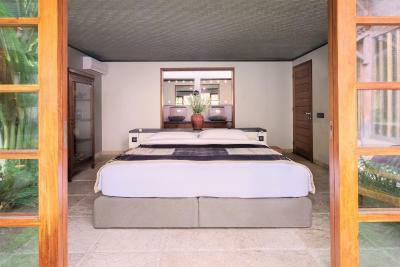 This luxurious and contemporary suite features a spacious roofed outdoor living and dining area fitted with a flat-screen satellite TV, CD/DVD player, an iPod dock and a mini-bar. 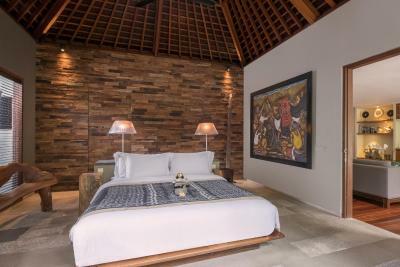 The bedroom is air-conditioned and comes with a wardrobe and an private bathroom featuring beautiful limestone and amber with stone bath facility and a separate shower. Fresh towels and bed linens are also provided. 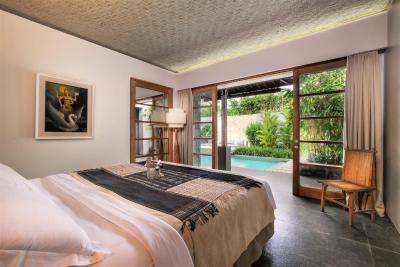 This spacious and elegant one-bedroom villa surrounded by lush tropical garden. 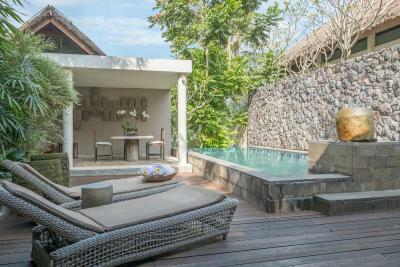 The villa itself was created using natural materials offering a haven which is fitted with modern amenities like flat-screen satellite TV, CD/DVD player, an iPod dock and a mini-bar. 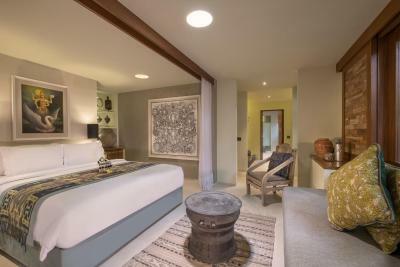 The air-conditioned bedroom has a wardrobe and a beautiful private bathroom boasting a stone bath. 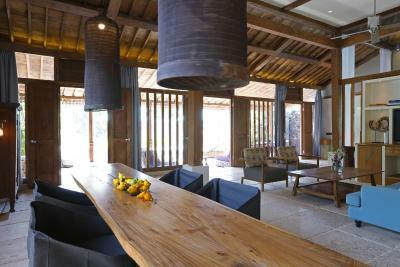 The separate living area opens directly to the outdoors. 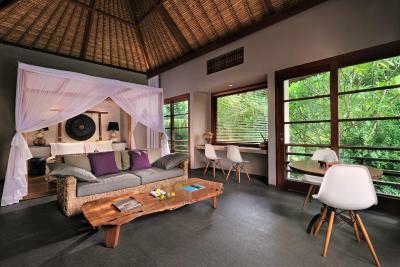 This luxurious and contemporary suite features a spacious outdoor lounge, an indoor living room fitted with a flat-screen satellite TV, CD/DVD player, an iPod dock and a mini-bar. 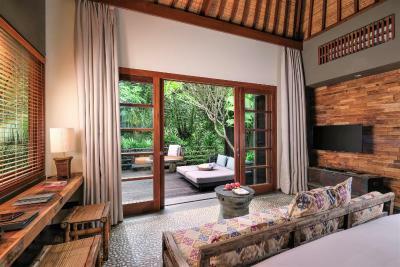 The bedroom is air-conditioned and comes with a wardrobe and an private bathroom featuring beautiful limestone and amber with stone bath facility and a separate shower. Fresh towels and bed linens are also provided. 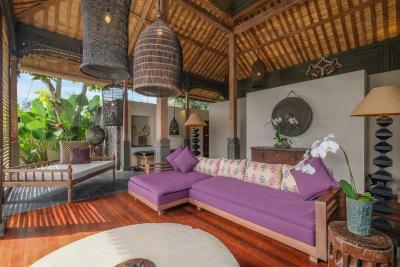 This amazing villa is tastefully furnished with traditional Indonesian artifacts. 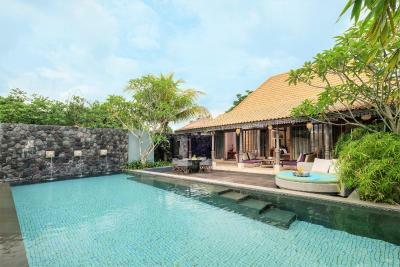 Able to accommodate up to 3 guests, this villa comes features a private pool, separate living space, dining area, and a kitchen. 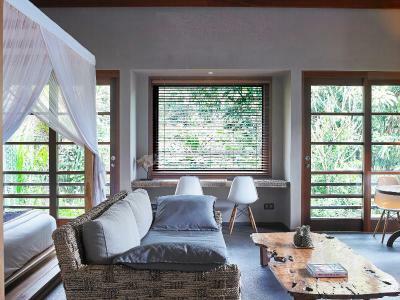 The bedroom where guests can enjoy fabulous view through the glass door, is air-conditioned and fitted with a wardrobe, as well as an private bathroom featuring bath and shower facilities, and free toiletries. Fresh towels and bed linens are also provided. 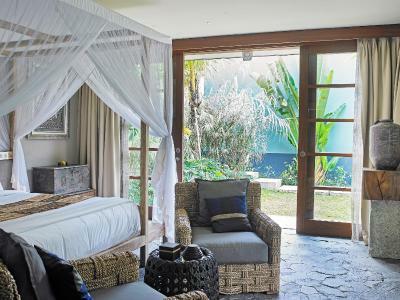 This spacious villa features a traditional Timor structure which has been completely redesigned and laid out over two floors. 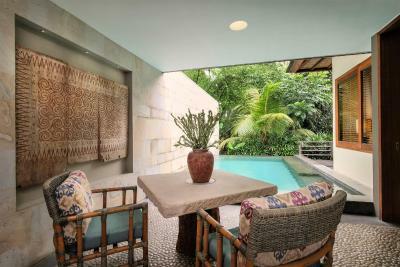 There are also a separate living area which opens up onto a wooden sundeck, semi-al fresco dining area, and a kitchen. 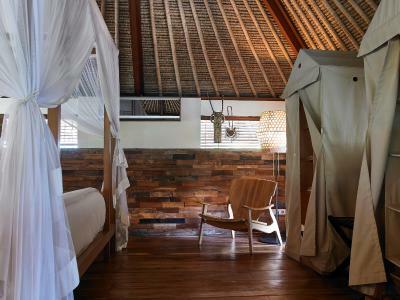 Each bedroom has a wardrobe and air-conditioning. 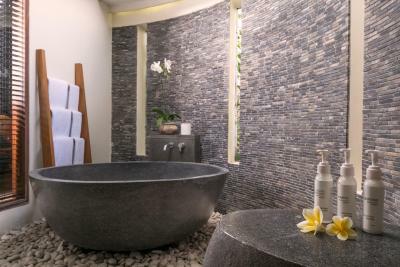 The private semi-open bathroom features a beautiful stone bathtub and separate shower room. 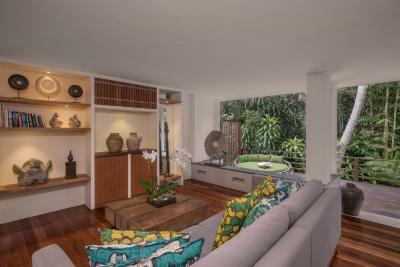 This beautiful and luxurious apartment is fitted with a separate living area, a dining area, and a well-equipped kitchen. 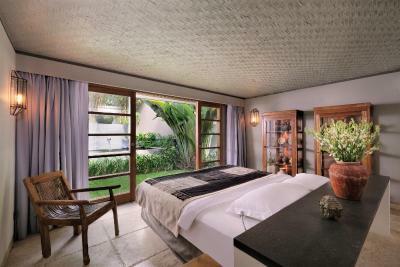 It also comes with dedicated massage and spa facilities were guests can enjoy relaxing treatments in great privacy. Each bedroom is air-conditioned and has a wardrobe, personal safe, and a private bathroom featuring shower facility, and free toiletries. Fresh towels and bed linens are also provided. 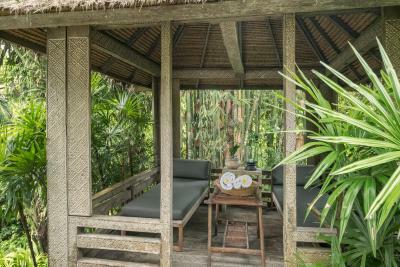 House Rules The Purist Villas & Spa Ubud takes special requests – add in the next step! 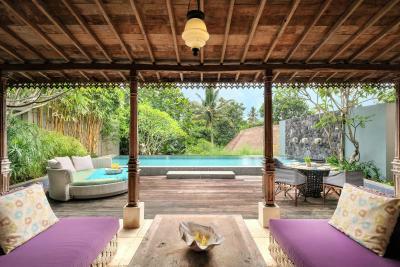 The Purist Villas &amp; Spa Ubud accepts these cards and reserves the right to temporarily hold an amount prior to arrival. 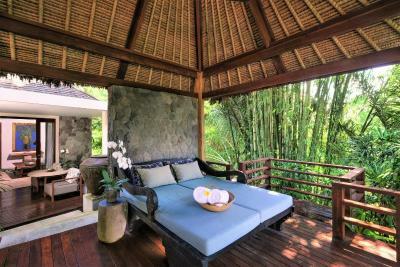 The Purist Villas & Spa Ubud accepts these cards and reserves the right to temporarily hold an amount prior to arrival. 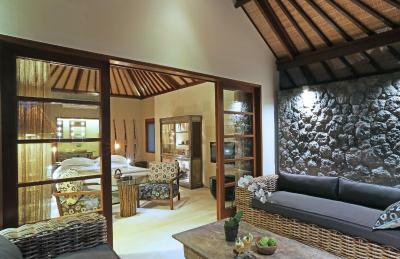 Please inform The Purist Villas & Spa Ubud of your expected arrival time in advance. You can use the Special Requests box when booking, or contact the property directly using the contact details in your confirmation. Not much except that the bread and the cinnamon bun was stale. Wonderful place, wonderful service, wonderful and great people! Great staff, excellent service, delicious food. River villa 2: Noise insulation isn't the best. There were kids in a villa behind/above us kicking in their private pool and you could hear it loud and clear 20m away in the room. The structure surrounding the shower in river villa 2 has a missing pane and you could easily be seen showering if someone walked by. WiFi not great but this is a given in Bali. We stayed in 6 places all over the island during our 5 week stay and never found truly fast internet. The hotel is stunning and there aren't too many rooms. Having two pools is also great. Depiani at the restaurant is just amazing. She's so kind, warm, and genuine - we'd come back just to see her! We ate all of our meals there and the food was impeccable, especially the mie goreng. The outdoor shower in villa number 2 was out of this world, I've never seen anything like it. 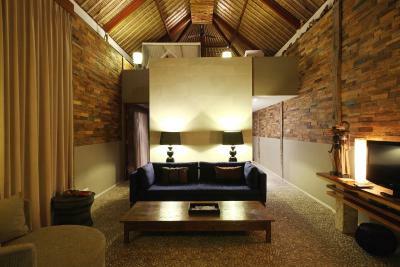 The layout of the hotel is also well designed - you feel like you have the place to yourself. Everything was good. The staff was very friendly and hospitality. We had a spa, it was a great experience, we loved it. Also we liked the restaurant, the kitchen was awesome. Watermelon juice - one love! 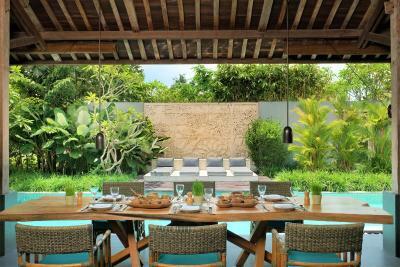 The breakfast is very healthy and delicious ~a lot of kinds you can choose ,and the Eggs Benedict is excellent.The staffs are all very friendly and nice.The 4days I and my family stay ed in the purist is the best time we spent in Bali. I am a light sleeper so perhaps ear plugs could have been in the amenities box as i felt i could hear early morning cleaning etc. The design was so lovely and the upkeep immaculate, all the staff went out of their way to please. The attention to detail was fantastic even the play list by the pool was perfect. Everything. 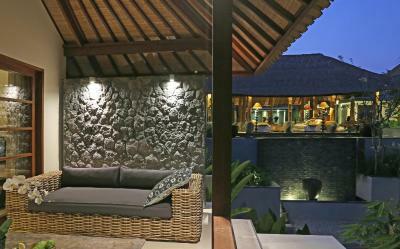 From the caring staff, the villas were very comfor6able and beautiful! Food was delicious. Massages at Spa were fantastic. 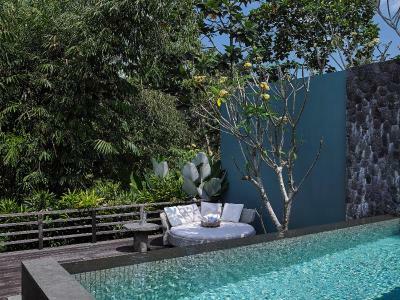 Would love to go back to the Purist Villas and Spa any time. The staff were so attentive, friendly and helpful. We stayed in the River Villa and it was super nice inside - hardly wanted to leave. There were constructing right beside our room so it was extremely noisy during the day. This affected the calmness of the place and was very hard to relax. I guess this is temporary though and because we were out almost all day it wasn't terrible, but would have been nice to know in advance that this was happening and even offered to get the room changed. 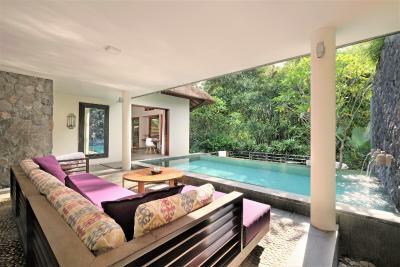 The Purist has amazing facilities, the pools are beautiful and I particularly liked the fact that it's a small resort/villas so it didn't feel crowded. The staff was super friendly and attentive, I would definitely go back! 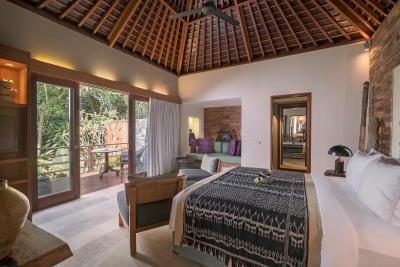 We had a jungle pool villa the room was huge and very nicely decorated. The private pool was a really good size and the breakfasts were very nice too.